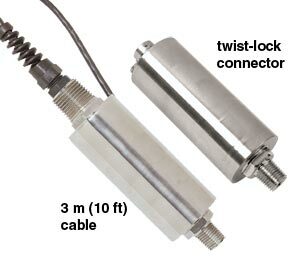 OMEGA’s PXM01 Series transducer is a very high accuracy, low noise 4-20 mA output, industrial pressure transmitter. Its all stainless steel construction makes it suitable for harsh industrial environments. A broad temperature compensated range of 60 to 160°F and excellent temperature compensation make this transmitter very stable with fluctuating temperatures. The PXM01 is available in gauge, absolute or sealed models as well as metric or psi ranges. G 1/4 and G 1/8, male or female fittings are available for industrial and hydraulic applications. The PXM01 is also available in standard/Imperial configurations, with NPT or UNF ports, and models from 0-2 to 0-30,000 psi pressure ranges. Please see the PX01 for complete details, or contact our Pressure department for more information..